Howdy! Finally we have the August round-up ready, - a week too late. A few days after the World Cup qualifier against France on 12 August, the Football Association decided that the next match, the world cup qualifier against Lithuania on 9 September, would be moved from Tórsvøllur in Tórshavn to Svangaskarð in Toftir. This was after a wish from Faroe Islands coach Brian Kerr. Some of the reasons were that Kerr thinks that the Svangaskarð stadium is more intimate than Tórsvøllur as the seats are very close to the pitch and should produce a better atmosphere, he claims, which again should help put more pressure on the referee to make the "right" decisions, he believes. As the hotel where the visiting players live is in Tórshavn, it takes about an hour to drive to Svangaskarð by bus, and also that is a factor Kerr wants in his favour, as this should tire the visiting players somewhat. And then Kerr more or less claims that the results at Svangaskarð have been better than those at Tórsvøllur. But that can not be proven at all. - Granted, If you go through the list of international matches at the two stadiums, you will probably find more Faroese points at Svangaskarð than at Tórsvøllur, but that is because the lesser nations have often played at Svangaskarð while the better nations have played at Tórsvøllur. Svangaskarð is also older, and thus more matches have been played there. The first competitive match that was played at Svangaskarð was in 1992 while the first competitive match at Tórsvøllur was in 2001. The most noticeable results at Svangaskarð in qualifying games are the two draws with Scotland in 1999 and 2002; a 2-2 draw with Slovenia in 2000 and another 2-2 draw with Bosnia Herzegovina in 2002. Then there have been 3 wins, all of them against small nations: San Marino in 1995, Malta in 1997 and Luxembourg in 2001. Those are the only points that have come from competitive matches at Svangaskarð. At Tórsvøllur the point-harvest in qualifiers is just a single point; the 1-1 draw with Austria a year ago. But generally the games at Tórsvøllur have been a lot tougher. We can mention world champions Italy who visited in 2007, France three times, Germany, Ireland and Russia to name a few. Had we played San Marino, Malta and Luxembourg at Tórsvøllur, that would also have produced victories there! But the Faroe Islands have also received some real thrashing at times at Svangaskarð like the 8-1 defeat to Yugoslavia in 1996 and the 6-0 defeat to Georgia in 2006. And although defeats are defeats, Germany were held to a 0-0 draw at Tórsvøllur until the 89th minute when they finally scored twice. Also France had to work hard for their 2-0 win at Tórsvøllur in 2004 and their 1-0 win this August, just like Ireland struggled to win 2-0 at Tórsvøllur in 2005 with no less than Brian Kerr as Ireland’s coach then. And finally it should be mentioned that one of the most lacklustre Faroese performances was a 1-3 defeat to Lithuania at Svangaskarð in 2003 – the same opponents as on Wednesday. Really, there is no proof that Svangaskarð in Toftir produces better results for the Faroe Islands than Tórsvøllur in Tórshavn. When former Faroe Islands coach Jógvan Martin Olsen put forward the same wish (playing at Svangaskarð), the Football Association basically told him to shut up. But the reply to Brian Kerr when he makes the same wish is just: "Ai ai, sir". This was something that Olsen was often up against. Basically, just because he happened to be a Faroese, he was per se treated as if he didn’t have the same competence as foreigners. Another very unfortunate thing with moving the match from Tórsvøllur to Svangaskarð is that the Football Association had already sold tickets for the match to be played at Tórsvøllur. That’s disrespectful to those who had already bought tickets for the match and is not the correct way to treat loyal fans. 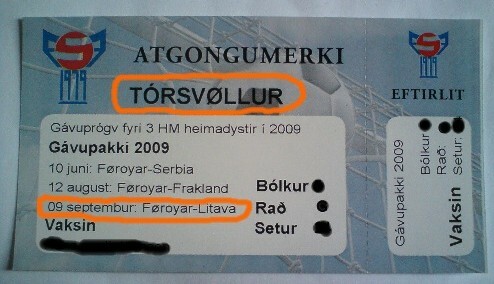 Picture above: Ticket for the match between the Faroe Islands and Lithuania which was originally scheduled to be played at Tórsvøllur Stadium. Although maybe a charming place with a view of the sea and surrounding mountains, Svangaskarð Stadium is not very well suited for spectators anymore as there is no room for your legs, and the seats that are in front you cut into your knees. It’s a really uncomfortable place to sit! Originally there were no seats, but only benches, but that was changed when FIFA demanded all stadiums to have seats only. On 1 January 2010, VB/Sumba (currently top of the table in 1st division) changes name to FC Suðuroy (Suðuroy is the southernmost island of the Faroe Islands). VB was founded in 1905 and won the championship in 2000. After that they started to struggle but resisted relegation for several years until they finally were relegated at the end of the 2007 season. Then they had already merged with Sumba. However, this name change does not mean that all of the clubs in Suðuroy are merging into one club, as has been the wish of VB Vágur and Sumba, who joined forces some years ago. Because at TB Tvøroyri, the oldest club in the Faroes and seven times champions, there has so far not been a majority for the merger. With the name change, VB/Sumba - soon to be FC Suðuroy - somehow hopes to drag TB Tvøroyri through the backdoors, so to speak. Because if the club already has a name of a unified Suðuroy, they hope that players from TB Tvøroyri and the rest of the island will be joining the new-named club, as it now – with the new name – will not as such be tied with the old enemy VB Vágur (and Sumba). TB Tvøroyri, founded in 1892 and the 9th oldest club in the kingdom of Denmark, won their last championship in 1987 but were relegated the following year and have never regained the strength of former times, although they have been promoted to the top division again several times, but since 1996 they have never managed to avoid the last place in their 4 attempts in the top flight. After TB’s 3-2 away loss to HB Tórshavn on Sunday, TB dropped to third in the table, 1 point adrift of B71 Sandoy, who are TB’s main rivals for the second promotion-spot. VB/Sumba look certain to hold on to their promotion spot as they top the table. As Suðuroy is a quite remote island - it takes approximately 2 hours by ferry from the capital Tórshavn to Suðuroy – the clubs on Suðuroy have found it difficult to attract players from other areas. And as just under 5000 people live in Suðuroy, TB and VB/Sumba naturally don’t have a lot of players to choose from, and when those 5000 people are split between 2 clubs, it is always going to be difficult to compete among the best (there is even a third club in Suðuroy, the smaller club Royn Hvalba, but they are pro merging). If we divide the 5000 by 2, that gives 2500 people for each club (now we have not taken Royn from Hvalba into consideration), and then it is only B71 Sandoy who have a smaller catchment area with around 1350 people living on the island of Sandoy which can be reached in 30 minutes by ferry from Gamlarætt, a harbour 15 minutes away from Tórshavn by car. But in the youth divisions, TB and VB/Sumba have competed as a unified team and the results there have been exceptional, winning several titles. KÍ have announced that they have appointed Petur Mohr as new head coach for the rest of the season. Former coaches Alexandar Djordjevic and Jákup Mikkelsen will stay on as assistant coaches. Mikkelsen is also KÍ’s goalkeeper. Mohr was also called upon towards the end of last season when KÍ were also in danger of relegation, but managed to steer them clear. This time it will be much more difficult than last season. With 6 matches remaining last season, KÍ were 3 points above the relegation line when Mohr stepped in. This time (when Mohr was appointed) KÍ were 4 points below the relegation line with 6 matches remaining. Mohr was also KÍ’s coach from 1991-1993 and guided them to the championship in his first season – KÍ first championship since 1972. During those 3 years, KÍ never lost a home match. Last season that fabulous record of Mohr was broken as KÍ lost 1-0 at home against NSÍ Runavík in the penultimate round. Remarkably, three of the players from the title-winning team in 1991 are also part of current KÍ team 18 years later, namely goalkeeper Jákup Mikkelsen, defender Jan Andreasen and striker Todi Jónsson. After Mohr was appointed coach at the end of August, the comment section of KÍ’s supporter club’s website, blaabylgjan.com (blue wave), has been closed. The rumour is that it was a condition set out by Mohr and that he would only become coach if that condition was complied with. But again, it is only a rumour that it was Mohr who wanted the comments off the page. 19 year old forward and U21 player Páll Klettskarð who joined KÍ during the summer break after a couple of years in Danish football with Fremad Amager (which became FC Amager and then went bankrupt) will not be available for KÍ anymore this season as he is moving back to Denmark to study and will be playing for Vanløse in the Danish 3rd level. He scored two goals during his stay at KÍ. As mentioned earlier in a B36 match report, relegation threatened B36 Tórshavn have appointed former EB/Streymur coach Sigfríður Clementsen as new assistant coach to the inexperienced head coach Mikkjal Thomassen. Some will suggest that Clementsen is the “real” head coach now. Clementsen was sacked from EB/Streymur after their cup final defeat in late July. With 5 matches remaining of the league, B36 are in 8th place, 3 points above 07 Vestur and KÍ Klaksvík in the two relegation places. 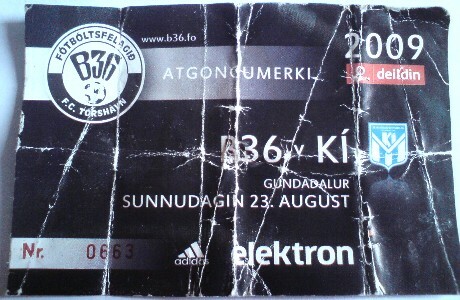 Picture: Is this an historical match ticket? It’s from the match between B36 Tórshavn and KÍ klaksvík last month. They could both be playing in the second best division next season. 18-year-old B68 forward Jóan Símun Edmundsson, who made his debut for the Faroe Islands in the world cup qualifier against France on 12 August, has been on a 4-day trial/training-stay at Manchester City where he trained with the reserves. He returned to the Faroes on Friday 28 August. Apparently there has also been interest from other British clubs as well as Scandinavian. NÍF Nólsoy, who play in the 3rd division have changed their name to FF Giza because none of their players actually live in Nólsoy, a small island with 250 inhabitants 20 minutes from Tórshavn by ferry. FF Giza is based in Tórshavn. On Saturday they beat KÍ Klaksvík to reach the semi-finals where they’ll face VB/Sumba. Dang, it will soon be time for September's round-up again. Sigh!